Migraine Headache Research Papers explore the treatment of this challenging condition. Possible causes and cures for migraine headaches. The history of migraines, i.e. when did the phenomena first appear in medical literature. When it comes to common debilitating pain, most individuals would agree that headaches represent one of the most challenging medical conditions to treat. This challenge is often exacerbated when it comes to the treatment of migraine headaches. Despite the fact that medical science has made thousands of advancements over the course of the last fifty years, the migraine headache poses such an enigma that researchers are now turning to naturopathic remedies as a potential remedy to combat the problem. Naturopathic treatments have become so popular over the last several years that they now represent a formidable method for dealing with the migraine headache. In order to understand how naturopathic remedies have become so important to the treatment of the migraine, a rudimentary look at what is known about migraines and their treatment is first warranted. Considering the basic definition of migraine headache, one author reports that, “Migraine refers to recurrent headache associated with visual or gastrointestinal symptoms lasting 4-72 hours, usually staring in the morning”. Although migraines are more prevalent than asthma or diabetes, little is know about the central cause of these headaches, although 70 percent of all sufferers have a family history of the condition. What medical science has discovered about migraine headaches is that they are caused by “excessive dilation of central blood vessels” in the brain. Unfortunately, however scientists do not know what triggers the dilation in the first place, although they know that it is not an event that occurs spontaneously. As such, investigators have come to conclude that when a migraine headache occurs the brain is responding to unique biochemical changes in the body, which promote dilation in the brain. Given the difficulty of pinpointing the root cause of the migraine, medical science has been limited in its treatment options for patients suffering from this condition. 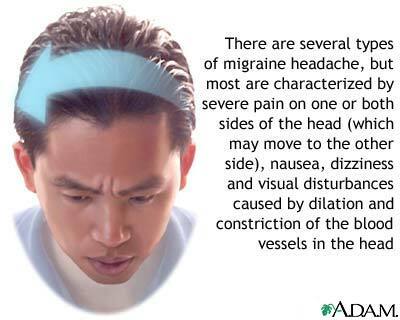 For this reason primary medical treatment for migraines typically consists of pharmacological intervention. Drugs that are capable of preventing blood-vessel swelling in the brain are the most formidable line of defense when it comes to treating the migraine patient . In addition to pharmacological intervention, physicians have also come to promote the use of behavioral treatments as a method for improving the overall quality of life for the migraine patient. “Over 3 decades of research have shown the utility of a number of behavioral treatments, chiefly relaxation, biofeedback, and cognitive behavior therapy, for uncomplicated forms of migraine and tension-type headache”. Thyroid Disease - Thyroid research papers will discuss an overview of the anatomy and physiology involving the medical condition. Sugar Addiction - Research papers on sugar addiction discuss how today's foods containing added sugar has created an addiction, which causes a host of illnesses if not under control. Lyme Disease - Research papers on lyme disease discuss the infectious disease caused by a bacterium that is transmitted to humans through the bite of tick. Health Benefits of Massage - Health Benefits of Massage Research Papers discuss how massage not only has relaxing effects, but has significant health effects. Bacterial Meningitis - This research paper on bacterial meningitis will examine the acute inflammation of the protective membrane that covers the brain and spinal cord. Wallenberg's Syndrome - Wallenberg's Syndrome Research Papers discuss this neurological disorder and its characteristics. Cerebral Hemorrhage - Cerebral Hemorrhage Research Papers delve into what causes this hemorrhage and the risk factors. Norovirus - Other symptoms can include a fever, headache, or general body aches as the immune system works to fight the infection. Paper Masters writes custom research papers on Migraine Headache and explore the treatment of this challenging condition.